Malaysia ranks among the planet’s most biodiverse regions. Pre-historic jungle sprawls for hundreds of kilometers along the Malay Peninsular and Malaysian Borneo. Millions of animals, birds and insects thrive inside the never-ending rainforests. Orangutans and pot-bellied proboscis monkeys swing from the trees. Civets and flying fox hide in the undergrowth as hornbills soar overheard. Plants of all shapes, sizes and smells create an impenetrable wall of green surrounding the enormous trees. Hundreds of species remain undocumented and new to science. But Malaysia’s ecological melting pot isn’t restricted to the land. Several marine parks give rise to Southeast Asia’s most beautiful coral reefs, turtle nesting sites and diving oases. 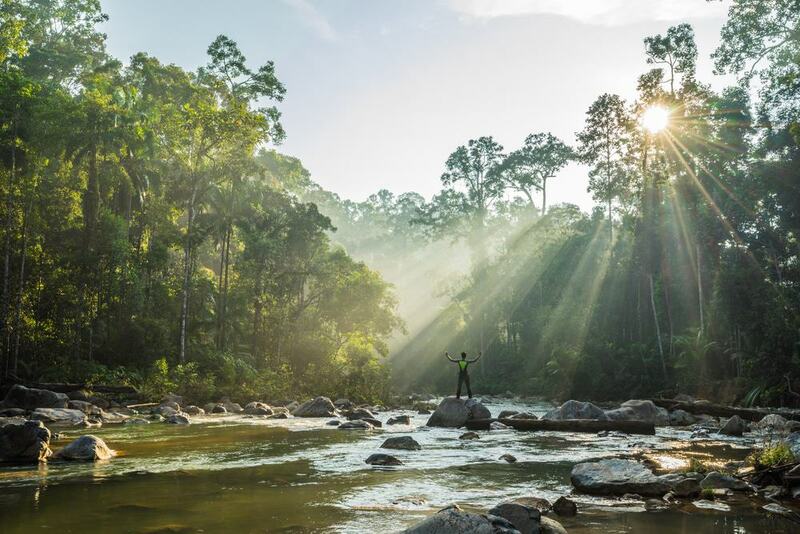 The Crazy Tourist rounds up the 25 best national parks in Malaysia for the ecotourist along with a handful of conservation centers and nature reserves. 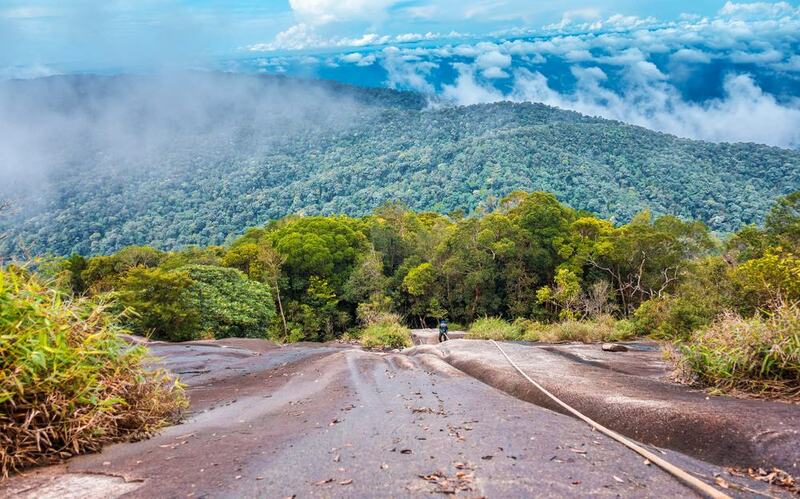 With an area of 438 square kilometers, Danum Valley houses almost half of the world’s flora and fauna. This includes orangutans, pygmy elephants and flesh-eating pitcher plants. 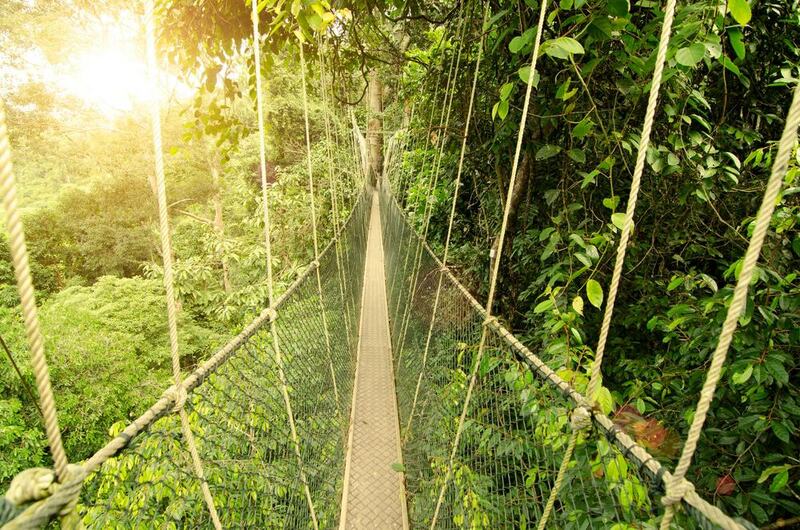 Travelers can go jungle trekking, wildlife spotting and test their nerve on canopy walks. Don’t forget to take advantage of their world-class conservation research facilities. Accommodation includes either a bed in a budget-friendly hostel. Or stay in the luxurious jungle chalets, the same ones as Prince William and Kate Middleton. Fly from Kota Kinabalu to Lahad Datu. The 130-million-year-old rainforest is approximately two hours from the airport along logging trails. Make reservations and plan your trip weeks beforehand. 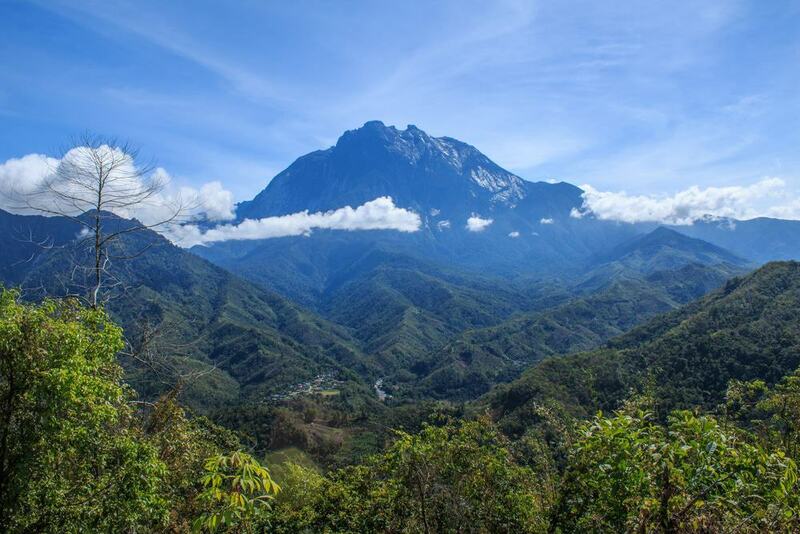 Mount Kinabalu dominates Kinabalu National Park near Sabah’s capital. At 4095 meters (13,435 feet), it’s Malaysia’s highest peak. Aside from mountaineering, the national park is a biodiversity hotspot. Thousands of species of flowers including the notorious rotting flesh Rafflesia and orchids grow in the forests. More than 4500 types of animals and birds nestle in the thick undergrowth too. Kinabalu National Park retains a pristine and relatively undisturbed environment. Combine a trip to Kinabalu National Park and nearby Ranau. Five islands form Tunku Abdul Rahman Marine Park in Kota Kinabalu. Dazzling white sand beaches border crystal clear azure waters. Head to Manukan or Mamutik for snorkeling with thousands of fish above the vibrant coral reefs. Visit Gaya, the largest island, and go trekking along jungle trails. Speedboats connect Jesselton Point in Kota Kinabalu. The Crazy Tourist recommends organizing an island-hopping tour. You can rent snorkeling equipment on the islands. Pulau Tiga, the original Survivor Island, received its protected status in 1933. Mud volcanoes formed Pulau Tiga (literally ‘three islands’) at the turn on the 19th-century giving birth to Malaysia’s youngest islands. The 158 square kilometers of protected area includes its vast marine ecosystems. Dense vegetation covers Tiga Island, the most visited in the small chain. Explore the set of Survivor, watch alien-like mud volcanoes bubble and take advantage of the almost-perfect snorkeling conditions. Kalampunian Besar Island, an eroded sandbank, has sugar-like white sand. Poisonous sea snakes nest on Kalampunian Damit Island. Sepilok nature reserve adopts, nurtures and cares for orphaned orangutans in East Sabah. The endangered primates lose their habitats from Borneo’s widespread deforestation. Rather than fending for themselves where the chances of survival are slim, young orangutans live inside Sepilok’s semi-wild enclosure. Highly trained staff teach them skills so that they can eventually return to the wild. Visit during feeding time at either 10:00am or 3:00pm. Travelers sometimes see up to 80 of our orange cousins. 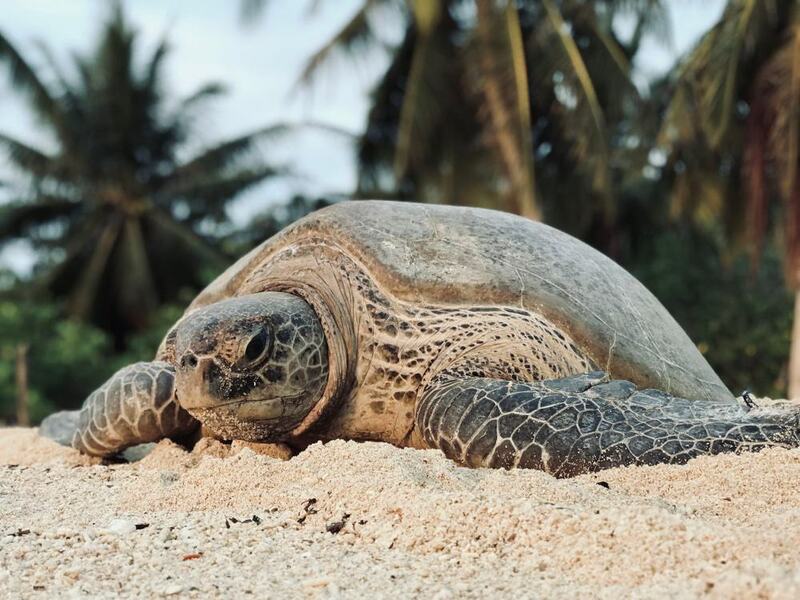 Turtle Islands serve as a vital breeding ground for critically endangered hawksbill and endangered green turtles. Countless giants nest on the island’s sandy coastline almost every night of the year, which virtually guarantees a sighting. Their most prolific period runs between July and September. Three islands form Turtle Island Marine Park including Pulau Bakungan, Pulisan and Selingan. Travelers first need to get to Sandakan in East Sabah. Ferries travel the 40 kilometers (25 miles) across the Sulu Sea to Turtle Islands. 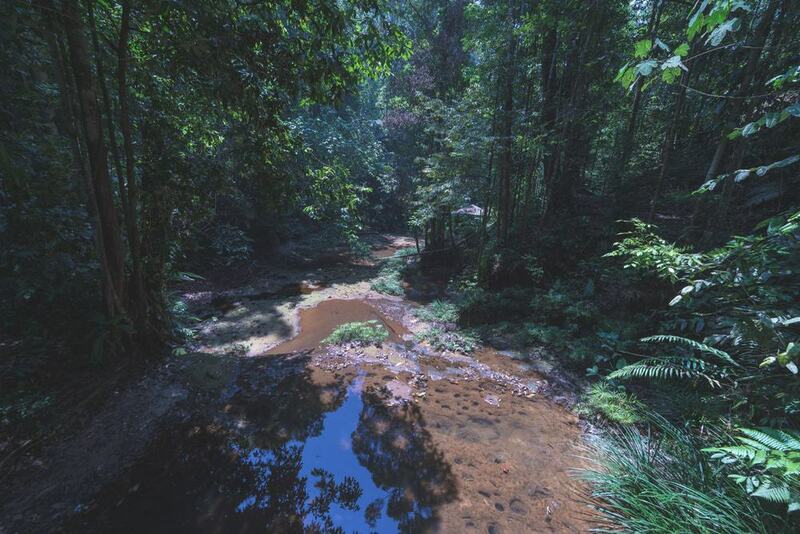 Maliau Basin is part of Borneo’s least explored section of rainforest. Covering an area that’s about the same size as Singapore, only half has been explored and mapped. Countless types of plants and animals live in the bowl-like basin. Over 80 species of orchids, six types of meat-eating pitcher plants and the enormous Rafflesia grow inside Maliau Basin. 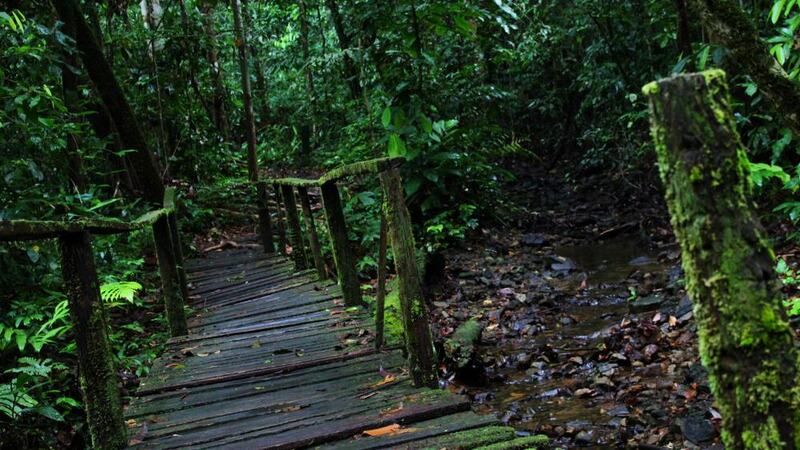 Travels can hike along 70 kilometers (43 miles) of jungle trails. 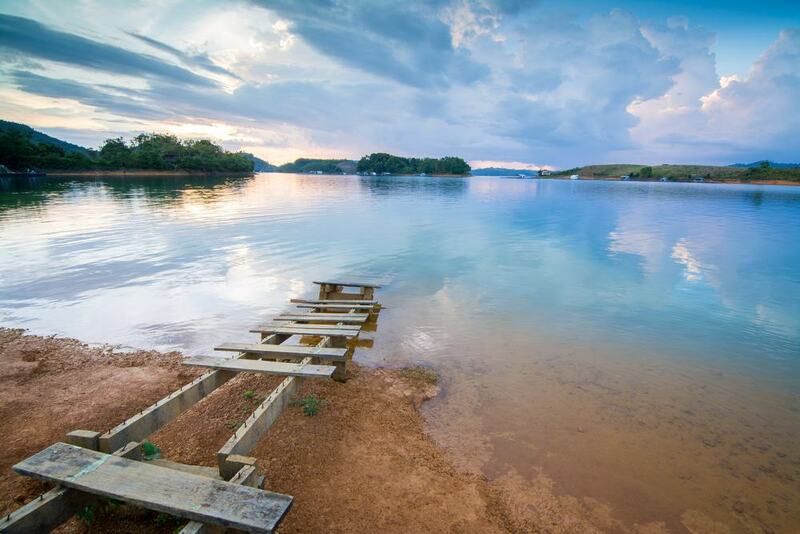 Lake Linumunsut, Sabah’s only freshwater lake, is inside to national park too. Borneo’s endemic proboscis monkeys are some of Malaysia’s most endangered species. Estimates suggest only 7000 of these floppy-nosed, pot-bellied primates remain. Sabah’s Labuk Bay near Sandakan houses about 60 of these monkeys in a semi-wild environment. Deforestation forces the communities into protected areas. Few places have such a large population of these rare species. Labuk Bay almost guarantees a sighting and can be reached within 45 minutes from Sandakan. 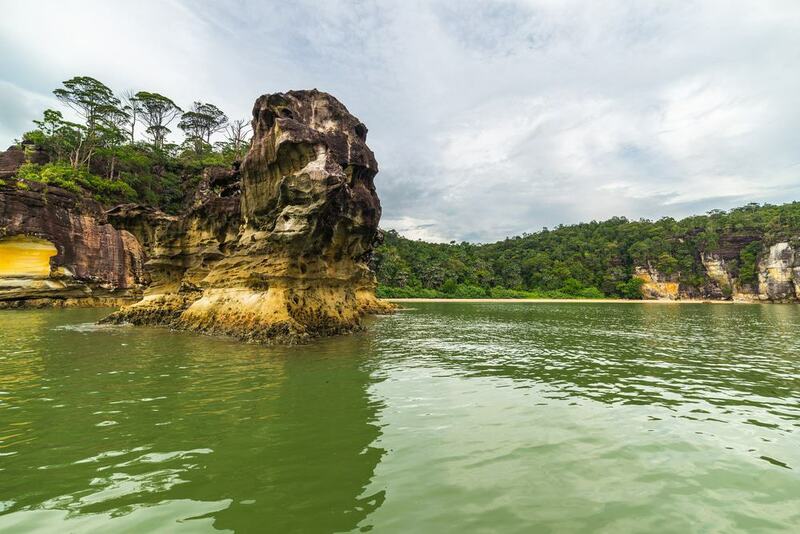 Bako National Park is both Sarawak’s oldest and most accessible national park. Sprawling across the Muara Tebas Peninsular, Bako lies 23 kilometers (14.3 miles) north of Kuching. Travelers need to take a short ferry into to enter Bako National Park. 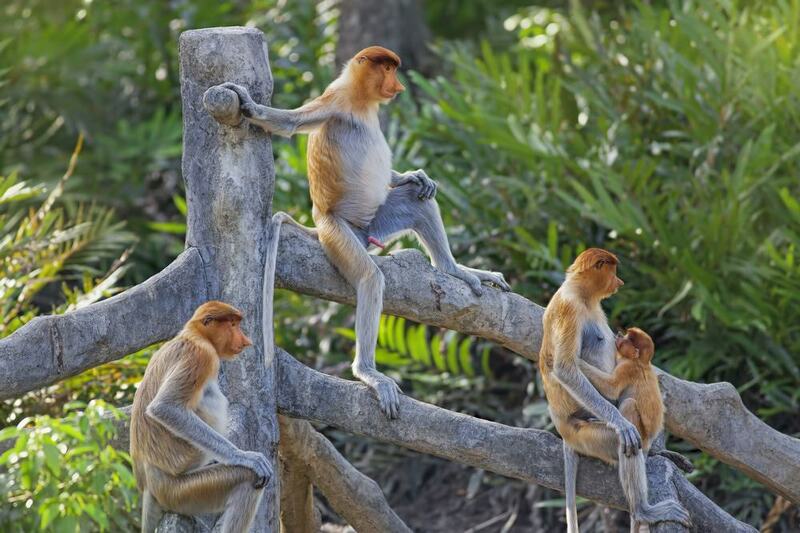 A troupe of proboscis monkeys live near Park HQ, which consistently excites visitors. A total of 16 colour-coded trails snake their way through the rainforest and jungle habitats. Some lead to beaches, others to waterfalls. River cruises weave through the mangrove swamps. Watch out for curious kingfishers on the branches and wild boars shuffling in the undergrowth. A trip to Bako provides a taste of the jungle within an hour from Kuching. Sarawak has an internationally recognized reputation for their spectacular caves. Nothing showcases these geological wonders better than Niah Caves. 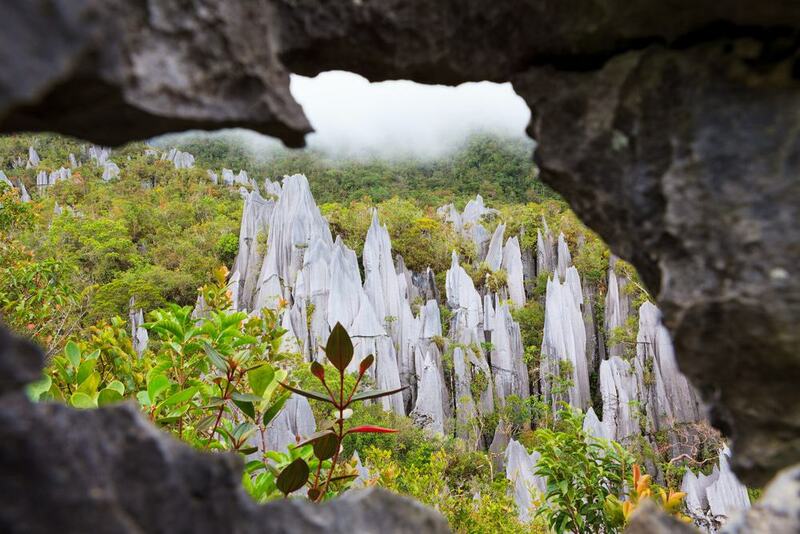 Niah National Park combines stunning rock formations and caves with Borneo’s melting pot of biodiversity. Join a guided tour through the cave systems where millions of squeaking bats hang overhead. Embrace the contrast from the steamy life-filled jungle to the cool, musty caves. Discover Niah Cave’s role in early human migration around Borneo. Prehistoric cave paintings and Malaysia’s oldest human skeleton at 40,000 years old were discovered inside. 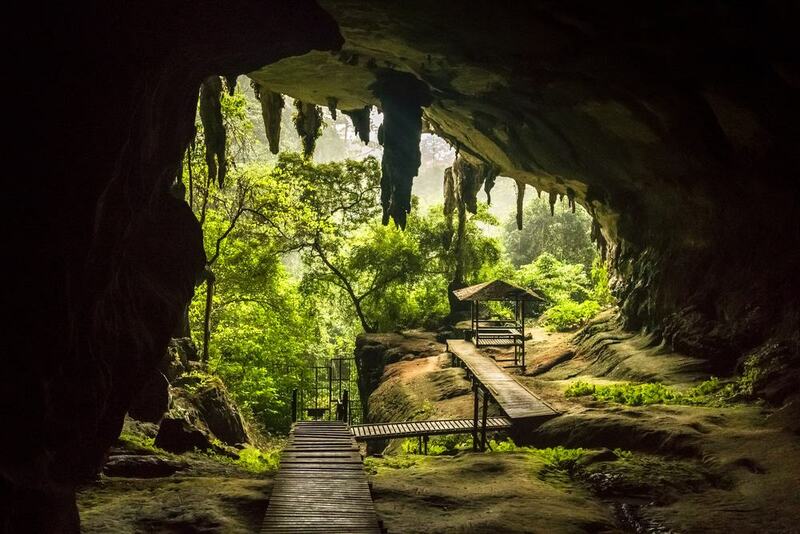 Visiting Niah is the easiest way to see Sarawak’s caves within one hour of Miri. Strolling through Gunung Mulu National Park feels like teleporting to another planet. Jagged mountains pierce low hanging clouds. Razor-sharp pinnacles shoot from the ground slicing through the thick foliage. Step beyond the almost-hidden threshold into a mysterious subterranean world. Gunung Mulu has countless cave passageways, geological formations and biodiversity. Sarawak Chamber has a place in the Guinness Book of World Records for the most voluminous known cave chamber. Because of its remoteness, getting to this national park requires a short flight from Miri. Otherwise, expect a multi-day trek through the jungle. Lambir Hills is among Sarawak’s smallest and least visited national parks. Despite its size, this protected zone packs a punch. Follow the color-coded trails through the jungle to waterfalls, natural pools and thriving ecological areas. Primates sit in the branches while a menagerie of tropical birds flutter above the canopy. But what sets Lambir Hills apart from Borneo’s other national parks is the promise of seclusion. Only a handful of travelers make the surprisingly short journey from Miri. 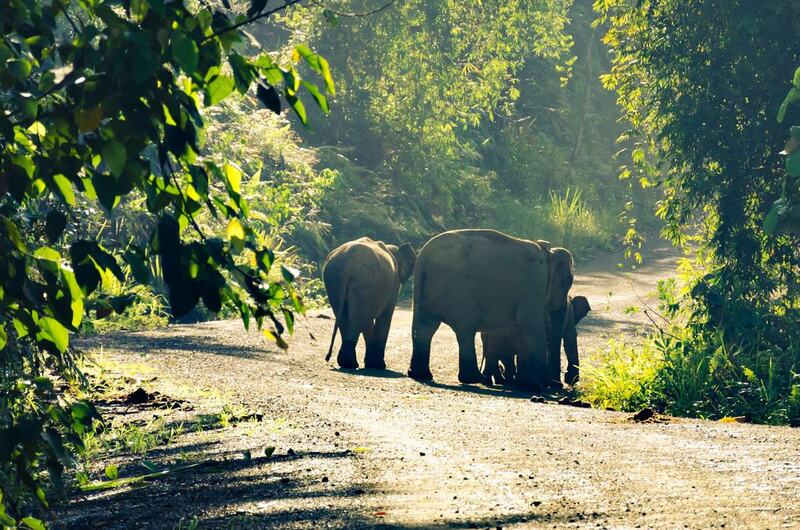 The jungle, wildlife and serenity will be all yours within 40 minutes. Sarawak’s Similajau National Park combines beaches, jungles and wildlife. Only a few tourists visit the national park that’s less than 30 minutes by car from Bintulu. Join a tour through different ecosystems and habitats. Guides will point out the wildlife and various types of plants. Or find a spot on the South China Sea’s dazzling shoreline where you’ll probably be alone. Travelers have access to a range of activities. Marked trails lead through the dense rainforests. 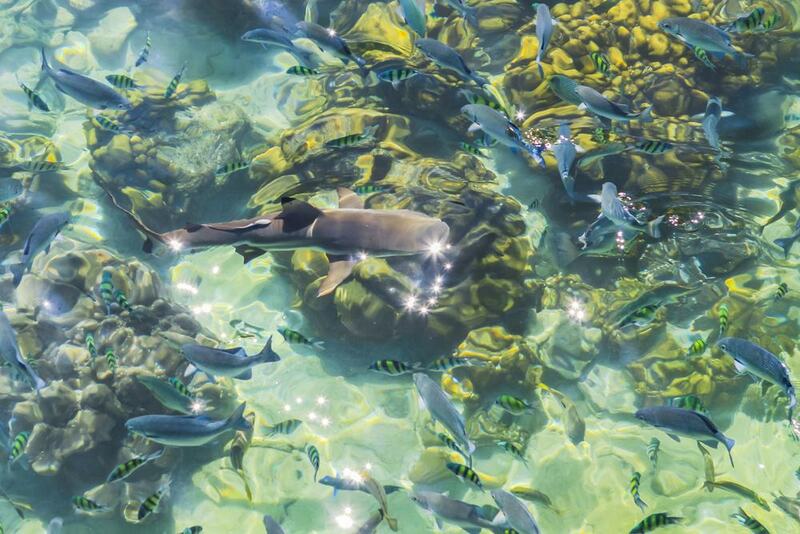 Crystal clear waters create stunning snorkeling conditions. After nightfall, boats drift along the murky waters in search for crocodiles. 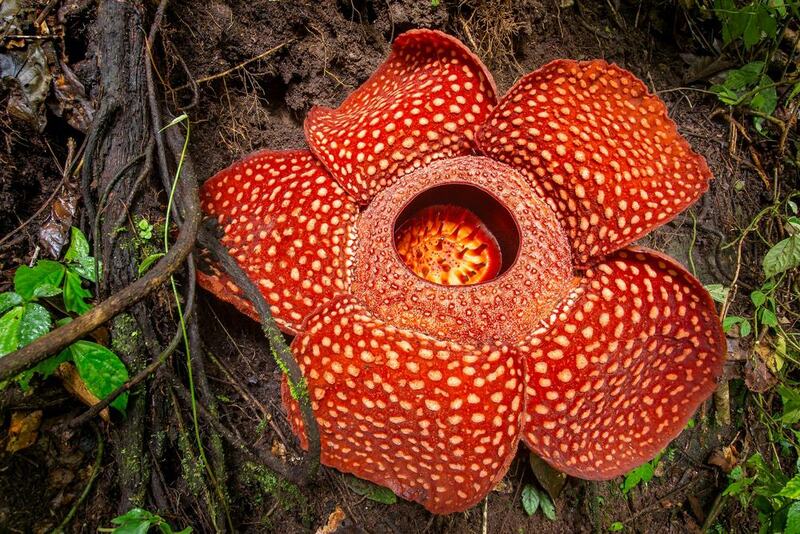 The highlight of Sarawak’s Gunung Gading National Park is their resident Rafflesia. Rafflesia has the unenviable title as the world’s smelliest flower. The huge plant releases an odor which smells like rotting flesh to attract insects, the bugs then spread its pollen throughout the forest. Aside from its ecological appeal, this national park is a haven for hikers. Follow the Waterfall Trail for an easy trek to spectacular scenery and natural pools. Or test your fitness climbing to the summit of Mount Gading at 906 meters (2972 feet). This involves some difficult terrain and takes eight hours there and back. Gunung Gading is approximately two hours from Kuching in southwest Sarawak. 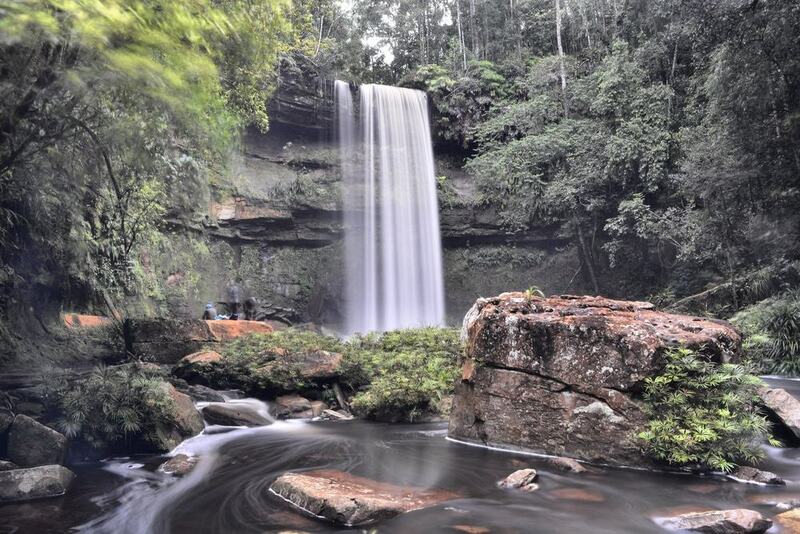 Batang Ai is one of Sarawak’s most inaccessible and fascinating national parks. Travelers willing to make the 250-kilometer (155 miles) journey east of Kuching will find an ecological treat. 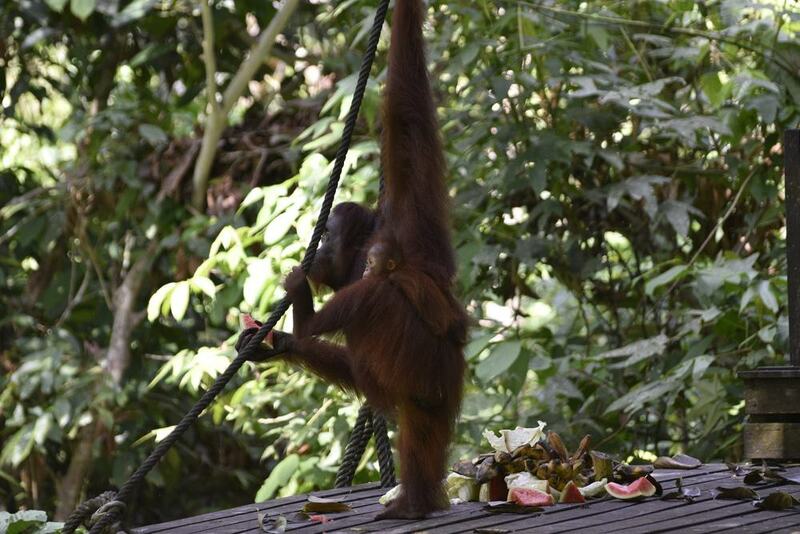 Orangutans, hornbills and white-front langurs live inside Batang Ai. Traditional Iban longhouses line the riverbanks. Visitors need to travel for several hours and take a boat to enter Batang Ai. When inside, follow jungle trails to a lake and fast flowing rivers. Getting here isn’t easy. But it’s worth it to stand in the middle of such a remote environment. Located near Sarawak’s capital, Kubah National Park provides an easy-to-reach section of the Borneo’s jungle. Travelers can find themselves surrounded by the towering dipterocarp trees within 45 minutes of Kuching. Marked trails lead through the forest. Howling gibbons echo through the canopy. Trek to waterfalls and natural pools before indulging in a refreshing dip. Or climb to the peak of Mount Serapi, which takes around six-hour return. Combine a trip to Kubah National Park with the nearby Matang Orangutan Rehabilitation Center. When people hear the name Kuala Lumpur, they think of the Petronas Towers, shopping malls and a metropolitan capital. 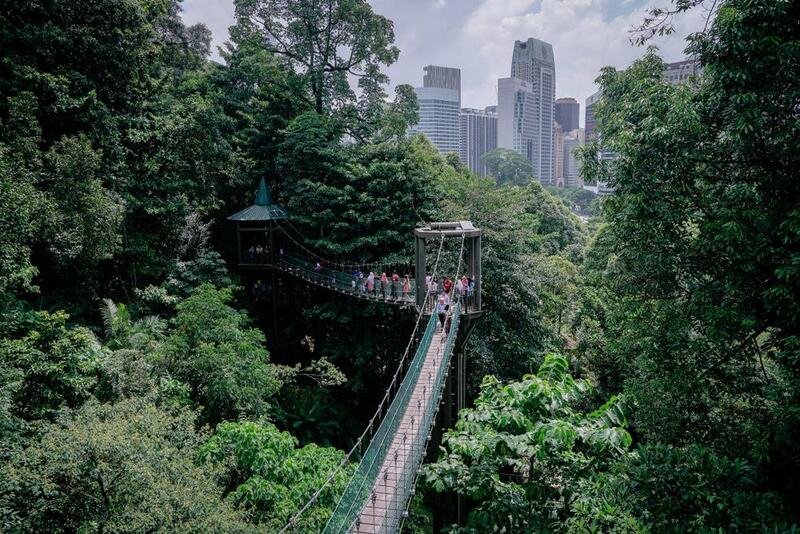 Hidden inside the concrete jungle is the tiny KL Forest Eco Park. Lush green scenery provides a green haven in the heart of Kuala Lumpur near KL Tower. Follow the light trails over the boardwalks and get a flavor of the jungle without travelling out of the city. Or sit under the shady trees and watch the birds and monkeys. Buy entrance tickets near KL Tower. Taman Negara, not-so-creatively translated as ‘National Park’ in English, is more than 130-million-years old. The 4343 square-kilometer protected area has jungle treks, canopy walks and caves. Gunung Tahan (Mount Tahan), West Malaysia’s tallest peak, is inside Taman Negara too. Get a guide and head deep into the rainforest in search of primates, slow loris and the occasional flying fox. Spend the night and take a night safari to witness the explosion of nocturnal life in the jungle. Mount Ophir soars 1276 meters (4186 feet) in Johor State. Gunung Ledang National Park surrounds the peak. Trails pass through the steamy canopies and snake their way up the steep mountain. Others lead to waterfalls including Puteri Waterfall. Rainforest suddenly opens to vantage points that offer panoramic views of the ancient jungle below. Tropical birds of all sizes flutter above. The Crazy Tourist recommends hiking to the summit and soaking in the waterfalls to cool down later. The prehistoric rainforest in Endau-Rompin National Park looks the same as it did millions of years ago. Lowland forest sprawls over 870 square kilometers in both Pahang and Johor State. The Endau and Rompin Rivers converge inside creating waterfalls, natural pools and spectacular scenery. Trails lead through the Jurassic Park-like environment. But what really makes Endau-Rompin worthwhile is the chance to explore its untouched jungle. Follow the trails deep into the heart of the forest and stand where few humans have stood before. Civets, wild boar and hornbills sometimes make an appearance. Endau-Rompin closes during the monsoon season between November and March. 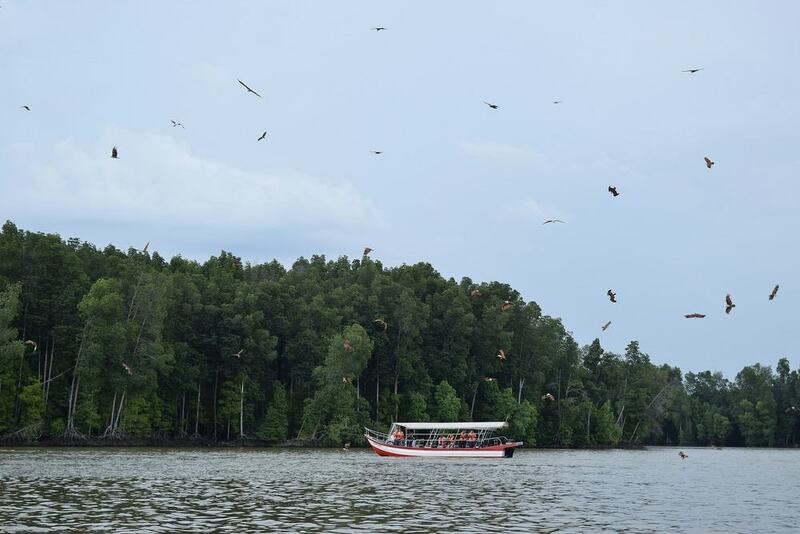 Mangroves play an essential role in Malaysia’s diverse ecosystems. The swampy areas both protect coastlines and form habitats for thousands of birds and mammals. Matang Mangrove near Taiping provides an opportunity to explore this little-visited environment. 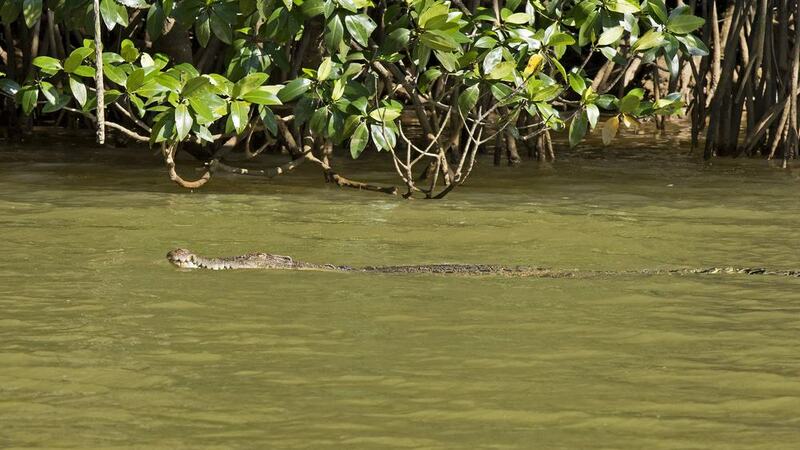 Take a boat trip through the mangrove trees, the ones that wouldn’t look out of place in a horror film. Unleash your inner twitter and search for the 80,000 or so migratory birds that make the region their short-term home. River dolphins sometimes swim into Matang’s mangroves too. Aside from an ecological experience, learn about the region’s status as a Southeast Asian powerhouse for charcoal production. Perak is known for limestone cliffs, caves and rainforests. 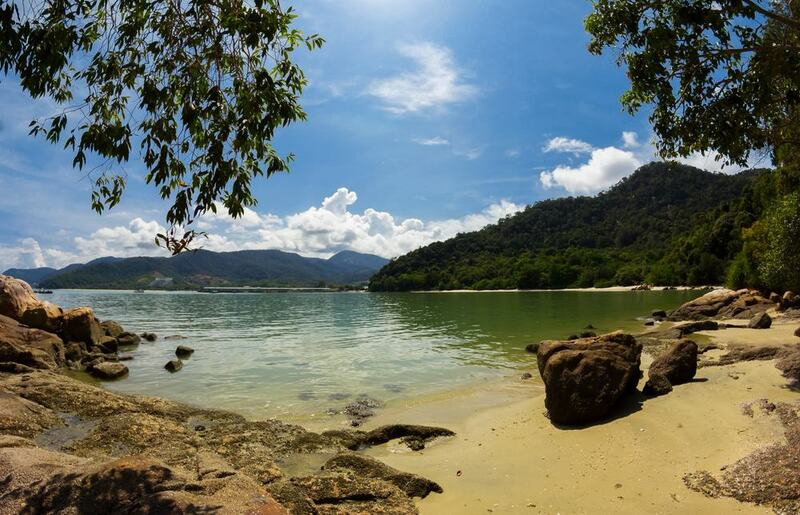 Royal Belum State Park showcases the best of West Malaysia’s biodiversity. Thick jungle creates habitats for millions of insects, thousands of birds and a handful of endangered mammals. Asian elephants and Malayan tigers live inside the jungle. Scientists believe a tiny community of the almost extinct Sumatran Rhinos are inside too. But these are so rare that they haven’t been spotted in years. Hike along marked trails and look for sun bears, tapirs and white-handed gibbons. 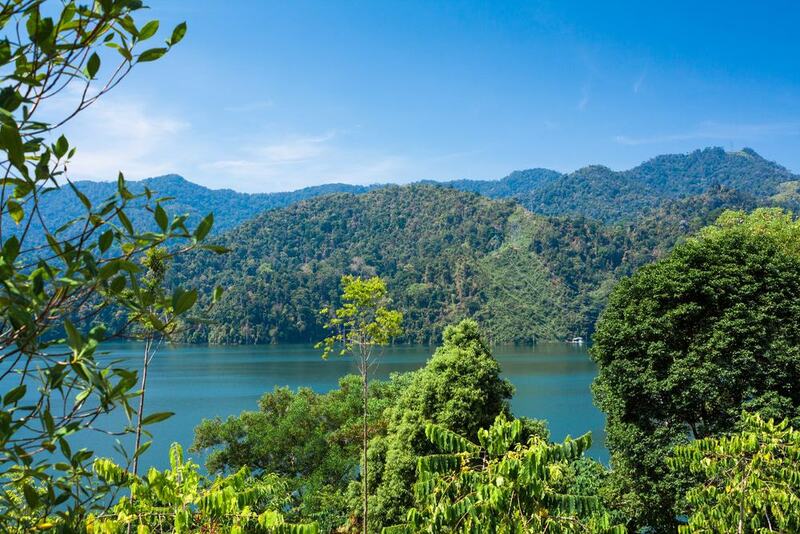 Travelers can visit Malaysia’s second largest lake, Lake Temenggor, and hike to waterfalls too. Langkawi usually attracts beach-lovers and backpackers. But a short drive from the postcard-perfect coast reveals an enormous national park. Boats speed along the gentle waters to hidden caves and eagle nesting sites. Macaques dive into the river and swim towards the boats. Caves filled with millions of bats penetrate the almost-vertical limestone cliffs. 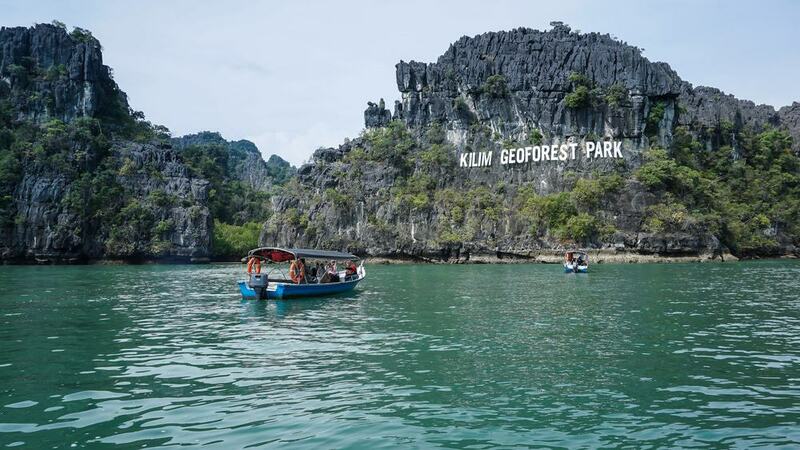 Travelers can join an affordable tour from the popular Pantai Cenang to Kilim Geoforest. The Crazy Tourist recommends joining the daily tours because of the high chance of seeing wildlife. Pulau Payer Marine Park holds a special place in the hearts of divers and snorkelers. The four island marine park covers two nautical miles with an ecosystem free of humans. Tight regulations prevent fishing, pollution and anything that could disturb the delicate ecology. Snorkel over Coral Garden where thousands of corals of all shapes and sizes flourish in the sheltered waters. Watch as grouper fish that are bigger than you pass by. Keep your eyes open for clownfish, black-tipped reef sharks and eels. Pulau Payer Marine Park is halfway between Langkawi and Penang. From Langkawi, take a 45-minute ferry to the uninhabited islands from Kuah. Penang Island has a reputation for British colonial architecture, shopping and food. But step outside of George Town and you’ll find Malaysia’s smallest and newest national park. The protected area has rainforests, beaches and decent-length hiking trails. 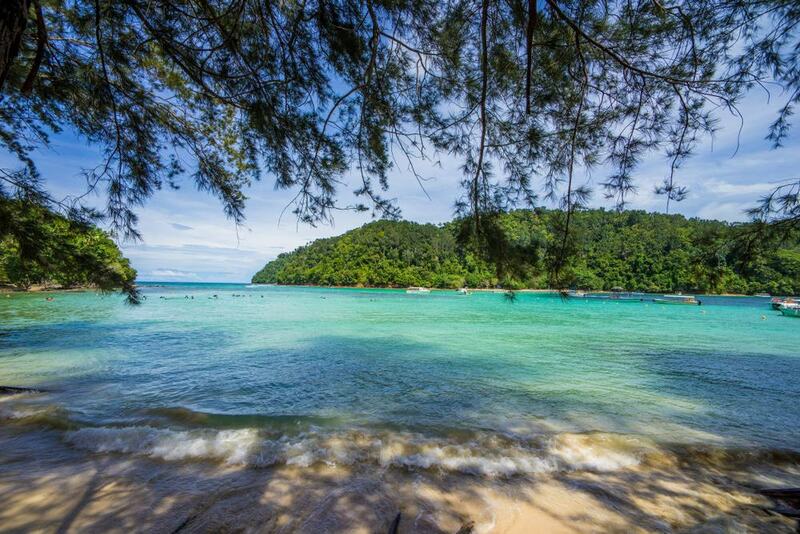 Take a day trip to almost empty beaches such as Monkey Beach and Kerachut Beach. Embrace the chance to get a feel for Penang’s rainforests without traveling too far from the island’s home comforts.